After a very cold late spring crops are finally starting to move and last potato plantings should be completed this week. Disease pressures in Winter Wheat have generally been low with the exception of Yellow Rust but conditions are likely to see Septoria developing soon. Crops are, generally, much more open than last year so ear counts per sq m are on the low side so maximizing grain sites and their fill is going to be critical to achieving high yields. In WOSR Light Leaf Spot has been the prevalent disease but the last week has seen perfect Sclerotina incubation conditions in the South and West and growers should be applying a fungicide at petal fall. Low soil temperatures and late frosts have impeded the growth of spring crops, Top Fruit and Vines and most crops would benefit from an application of AminoA+. Apply 2.5 kg/ha AminoA+ to Winter Wheat (particularly varieties like Skyfall) from boots swollen to early flowering to boost yield and protein. Replicated trials show yield increases from 6-18%. Later applications will also improve proteins and may boost yield by improving bushel weight (3%) but are less cost effective. At a Feed Wheat price of £117 per tonne a yield increase of 150 kg (1.66% in a 9 t ha crop) will cover the cost of a 2.5 kg/ha application of AminoA+. Winter Barley apply 2.5 kg/ha to feed varieties from flag leaf to full ear emergence to boost yield and protein. Do not apply more than 0.5 kg ha with fungicide to Malting varieties at these growth stages as there is a risk of raising grain N levels. Spring Barley apply 1.5 kg/ha as soon as possible from GS 19 and repeat before GS31, further applications can be made if hot dry conditions are anticipated. 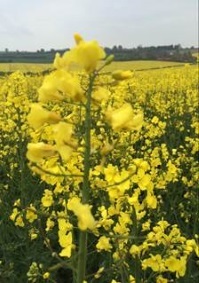 Apply 2.5 kg/ha AminoA+ at petal fall in combination with fungicide to extend greening and pod fill. Replicated trials show increases 250kg- 1 tonne ha. At a projected price of £270 per tonne, a yield response of less than 70 kg ha is required to pay for a 2.5 kg/ha application. We are still working on a project to use AminoA+ as a seed treatment and initial results are encouraging. Trial plots assessed this week are showing an advancement in maturity of 7-10 days. We are working on commercializing AminoA+ as a tuber treatment and initial trials look encouraging. We have set up a number of field trials and hope to be able to report positive results later this year. Use 2 kg/ha on maincrop potatoes after tubers have initiated and repeat every 14 days as required. Best results will be obtained by anticipating periods of stress (hot dry conditions, delayed irrigation) and applying before they occur, then apply as a routine every two weeks in the bulking period. Stop applications about 14 days before burn down. As N is a major limiting factor in organic potatoes make applications every two weeks of 2 kg/ha from tuber initiation onwards and stop 14 days before burn down. Start applications 2 kg/ha every 14 days soon after emergence, especially where you are re ridging, as product applied to the soil will also be worked in above the tuber. If you just want to stimulate tuber numbers 2-3 applications should be sufficient but in view of the high value and danger of tuber reabsorption if the crop goes into stress, keep treating up to 14 days before burn down. Apply 2.5 kg/ha at V7 (about 15 cm) as this determines how many ridges are formed on the cob and repeat if necessary 14-21 days later. 2 kg/ha from 3 leaves onwards every 14 days until crop is well established. Repeat when conditions are predicted to be very hot and dry. 2 kg/ha every 14 days until crop is well established from 2 leaves. Repeat when conditions are predicted to be very hot and dry. Apply 2 kg/ha from 3rd leaf stage every 14 days 3 to 5 applications. 2 kg/ha every 14 days through May & June then every 4 weeks before harvest. Applications after harvest 1.5 kg/ha every 7 days (3 x 1.5 kg ha) will build up the tree for the following season. 4 x 2.5 kg/ha between start July and end September in combination with fungicide and insecticide has given excellent results. Ask about our Asparagus programme. Vegetable plants / Asparagus crowns etc. Make a solution 5 kg in 100 litres water and dip at planting. 2 kg/ha every 14 days until well established. 2 kg/ha every 14 days from the start of spring growth either as a foliar or through fertigation. NB delay applications in un-irrigated crops until after flowering as excessive numbers of fruits may be stimulated. 2 kg/ha every 14 days as required. 2 kg/ha every 14 days after shoots reach 10 cm in length. Stop foliar application after grapes reach 6-8 mm as AminoA+ applied after this stage can cause weaker skins and excessive leaf growth. Switch to fertigation and apply up until harvest. AminoA+ is designed to be used as a foliar spray or through fertigation systems. It may also be used by both methods simultaneously. Add to fertigation stock solutions 3.5 - 1 gr per litre. AminoA+ is totally water soluble but should always be applied through an induction hopper, premixed or washed through a screen never add directly into the spray tank. AminoA Ltd gives no warranty and accepts no liability in respect of physical compatibilities; therefore, use is at grower's own risk. For any tank-mix it is important that the appropriate manufacturer's recommendations should be consulted and followed, and care taken to ensure that applications are made within the recommendations for each product. AminoA+ is packed in 15kg. bags and orders will be couriered out onto farm on the next working day provided orders are received before 12am. Retail price is £7 per kg plus delivery charge.